National Geographic has just published an exclusive article about the discovery of a "Megalopolis" in the jungles of Guatemala. According to the article, some 60,000 structures were discovered using LiDAR, providing previously-unrealized information about Guatemalan civilizations from over 1,200 years ago. LiDAR technology allowed the virtual removal of the tropical canopy in order to better "see" what lies beneath. 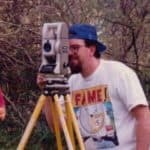 I have been providing seminars for a couple years teaching surveyors how to use LiDAR to recover Ancient Ways, Old Stone Walls and other evidence of occupation that would otherwise be lost due to overgrowth. Last year, I provided a KMZ of a surface model to a 93-year old surveyor who was able to recover the original stone walls called for in the deeds. His only other option was gasoline and a match. Instead of clear cutting a few acres over overgrown mess, his crew cut right to the wall, then cleared out the wall. At deposition, he blew away the other side. They did not expect this level of technology from the old timer and it hopefully resolved the conflict before it got to court. If you want to pay, go buy Global Mapper. If you do not, use FugroViewer. There are other options out there, but these two are the best place to start. Are there any lidar units that are affordable to mount on the dji type drones? I guess "affordable" can mean a lot of things, but how about "cheap" to narrow it down a little. There was an article in pob about Riegl receiving a technology innovation award for a miniaturized LiDar sensor, but did not state the msrp.